You might be surprised to know that the Choy Sun Dao slot machine is one of the most popular and most famous in the entire world, but mostly in Macau and Australasia. In Macau this slot is absolutely everywhere and seems to be the most common game out there by a mile. Its a nice game and you can play it here for free! 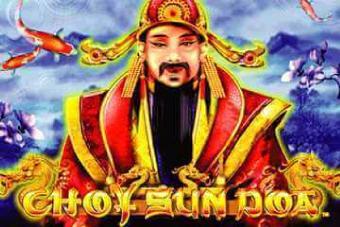 Choy Sun Doa is an Aristocrat-powered slot machine featuring a standard 5x3 layout and offering 243 ways to win. Its name translates to the God of Prosperity or Wealth and it is themed on Caishen, the Chinese God of Wealth. The reels are home to high paying symbols including golden dragons, jade rings, golden coins, Koi fish and red packets with golden coins. Playing card symbols from 9s through As award low-value prizes. The God of Wealth himself stands for Wild that appears on the reels 2, 3 and 4 only to replace all the symbols except for Scatter. Scatter is depicted as the golden ingot and you have to land 3, 4 or 5 of these on the reels left to right to trigger the Free Games feature. Once the feature is triggered, you will be offered to choose from 5 options. The Yellow Fish feature awards 20 free spins with Choy Sun Doa Wild acting as a 2x, 3x or 5x multiplier when included in a winning combo. The Red Fish feature awards 15 free spins with wins completed with Wilds subject to a 3x, 5x or 8x multiplier while Blue Fish grants 10 free spins with Wilds coming with a 5x, 8x or 10x multiplier. Finally, if you opt for Pink Fish, you get 8 free spins with all combinations completed with Wilds multiplied by 8x, 10x or 15x while Green Fish awards 5 free spins with wins created with Wilds multiplied by 10x, 15x or 30x. All multipliers are randomly awarded. What's more, during the free spins feature you can win a random award between 2x and 50x your bet if the Red Packet symbol appears on the reels 1 and 5 at the same time. The number of Money Pot symbols shows the number of random prizes that can be collected during the feature. The Choy Sun Doa slot also benefits the Reel Power feature that allows you to decrease a number of reels and ways to win. Although the game can be played at 1 reel with only 7 positions and 3 ways to win, for the best odds of winning try to keep all reels active and win as long as you land matching symbols on adjacent reels left to right. The top paying symbol is the golden dragon awarding 1,000 coins for a five of a kind combination. If you land 5 Scatters left to right, you will win 50x your bet. It is obvious that the most lucrative winning combinations can be won during the free spins feature thanks to multipliers going all the way up to 30x. However, the more free spins, the lower multipliers, so choose one of the combinations wisely. An additional chance to win up to 50x your bet during the bonus game makes it even more attractive and exciting. It is a bit disappointing that Wilds land only on the three central reels, though. Being a land-based slot machine that is developed for mobile play is obvious in the way this Aristocrat product looks. 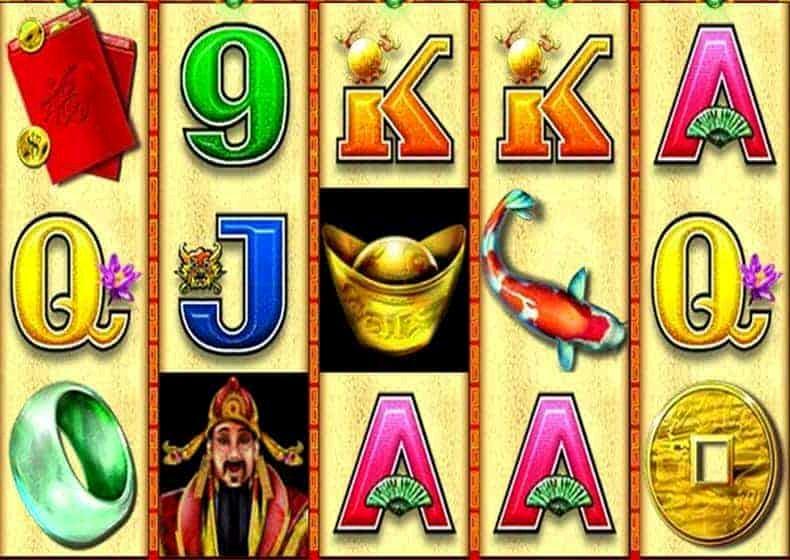 Not only that it uses one of the most generic themes in the casino industry, but it looks like many other Oriental-themed slots. There is nothing unique in it and even sound effects of spinning reels are generic. The only catchy thing about Choy Sun Doa is the way the God of Wealth laughs when contributing to a winning combo. This Aristocrat product comes with an RTP between 94.516% and 94.606%, which is not the most desirable range, but indicates that the game pays well for the money wagered. Despite all its downsides, you can give Choy Sun Doa a try because of the rewarding bonus features that can boost your odds of winning and help you score hefty payouts. One of the things about the Choy Sun Doa game that really stands out is the music in the bonus round. It really gets into my head whenever I hear it being played. In Macau, the music can be heard in all of the casinos, because the game is so popular and there are so many people playing it there. You will find that in Macau, they have lots of slot machines, but not much variety in the games themselves. So, in Macau they might have 50 or 60 Choy Sun Doa machines all with the same area, whereas that would never happen in Vegas.